With the freedom of two bodies, does Gyllenhaal make every minute count in Source Code? The film’s title is named after the life support machine that allows Captain Stevens to access the last eight minutes of Sean Fentress’ memory before he dies on a train bomb attack. Like Groundhog Day, Stevens is repeatedly sent back to these final eight minutes to uncover the identity of the bomber and to stop any further attacks. With only his second major feature length (following Moon), director Duncan Jones manages to safeguard the film from becoming monotonous, despite the same train-scene happening some ten plus times. Each time a different outcome is achieved determined by Stevens’ actions and each eight minute scene builds more excitement, leaving the viewer urging Captain Stevens to go back to the train and succeed. Offering the lead more screen time by playing Stevens in Fentress’ mind, Jake Gyllenhaal executes the role in both men’s bodies without needing to change his personality. With one side he lets the viewer get immersed in Fentress’ train-world by interacting with the other passengers and developing an interest in his girlfriend, while on the other he manages to keep the audience alert by acting on impulse to find the bomber in true military fashion. This is interesting to watch and is a clear indication of Gyllenhaal’s ability to deliver complex and enjoyable characters even in action/sci-fi. 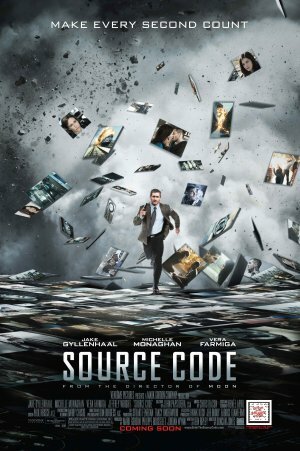 Source Code was billed to be a fast paced action film and that is certainly the case during the train scenes. Although the segments between these scenes are a lot slower than expected, they do compliment the story line by allowing the supporting cast to provide more narrative, character development and expand on the story, which merits the film. Despite being highly repetitive, the train scenes never become dull or boring to watch, and combined with Gyllenhaal delivering the lead fantastically, we end up with a fairly decent action film. The setting perhaps limits the film, but the creators do well to combat this with off-train scenes in between. If you enjoyed this film and are a fan of Jake Gyllenhaal then you are extremely likely to enjoy Donny Darko.